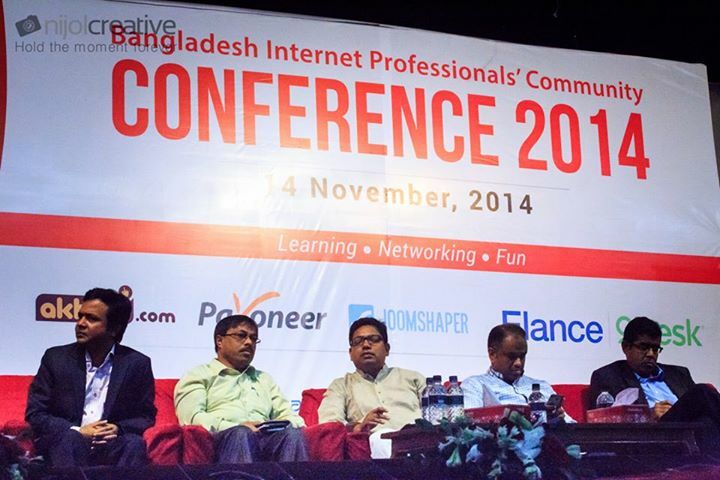 On the 14th of November, Bangladesh Internet Professionals Community (BIPC, a social media organization) organised a day-long conference for professionals who are involved in providing freelance services via internet to clients all over the world mostly United States, Europe at Mahanagar Natto Mahcha in the capital city Dhaka. State Minister of Information and Communication Technology (ICT) Division, Mr. Zunaid Ahmed Palak, inaugurated the conference. The conference was the first of its kind in the country and drew a massive audience from all over the country comprising mostly of freelance web developer, software developer, social media marketer, SEO professional, graphics designer etc. The multiple sessions focused on advice from noteworthy individuals from the Information and Communication Technology (ICT) sector and were aimed to support and motivate the attendees in their careers. BIPC mentioned that there are approximately 700,000 internet professionals working in Bangladesh. Mr. Palak also noted that back in 2009 there were only one million internet users in Bangladesh whereas now that number has escalated to over forty million. He said, “The flourishing internet has opened the window of freelancing, which is why, from the very beginning, our government has emphasised on increasing the number of internet users.” Hence, great onfidence was expressed towards the ICT sector and by next year, it could contribute to more than 1% of the GDP. Senior Vice Chairman of Bangladesh Association of Software and Information Services (BASIS), Mr. Russel T Ahmed said: “BASIS started the ‘One Bangladesh’ campaign for internet users and under this vision, by 2018, the country will earn at least US $1 billion, adding that BASIS wants to create 1 million IT professionals. A major barrier to freelancers here is that they do not have access to PayPal, a service which offers secure online transactions. The absence of this service in our country has lead to Bangladeshi freelancers having a great disadvantage against other internationals. Hence there was advocacy towards gaining access to PayPal in Bangladesh. The event was hailed as successful and the organisers have promised to host such events in the future as well to facilitate the growth and development of our ICT sector and of independent freelancers. Let’s thank Mobarok Hossain, freelance business plannign consultant and Abul Kashem, CEO & Founder of Xpnonetweb for taking the initiative of this conference. Platinum sponsors of this event were Akhoni.com, Payoneer, Joomshaper, Elance and Odesk, gold sponsors were ajkerdeal.com, Creative IT Limited and Xademy. Pickaboo launches Mobile Mela with discounts up to 67%!